BURBANK, CA – The vintage Colorado Rockies baseball cap worn by Rhune Kincaid since before the team’s first game announced it’s retirement today after a 19 year career that saw the inaugural game, a 1995 playoff game and the 1998 All-Star Game. The hat was forged with a prototype logo featuring slimmer letters and no serif on the lower part of the “C.” The smaller logo was hard to see and almost colorless due it’s its minimal use of purple thread. 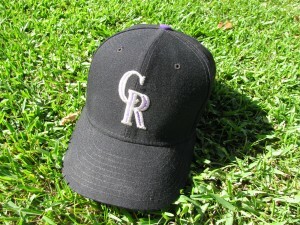 The hat’s last game was a memorable one in which the Rockies won a rain-shortened six-inning affair in June of 2010. Already suffering from years of adolescent, teen and grown-man sweat, the hat absorbed copious amounts of rain and was never the same after the consequent shrinkage. The hat is survived by it’s Denver Broncos counterpart, a veteran of three seasons, and replaced in the lineup by a new purple alternate Rockies hat. The 7-1/4 sized legend lasted longer than any other hat making it a lock for the hat Hall of Fame. This page took 0.690 seconds of computer labor to produce.